One of my new productivity podcasts is Jeff Goins goinswriter.com. 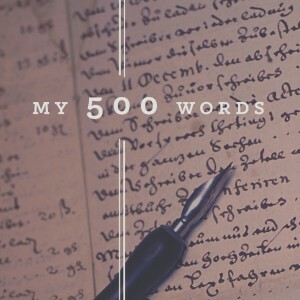 One of his challenges to the budding writer is to write 500 words a day. It reminds me of morning pages that were part of Julia Cameron’s The Artist’s Way. It’s not that I am not writing – but most of my writing is not for my ‘platform,’ but for my other projects – like grad school, or my work over at RethinkingHell.com. So this is just a fun way to keep my blog fresh. And to be a little more conversational and less structured – though I expect that the long term value of such off the cuff writing will be low. But I’ll try to be open, honest, and as raw as possible to make it worth the readers’ while (or is it wild?). So, this is already at about 150 words. So, what to write on? How about the uselessness of writing a public stream of consciousness for a month, when really, I’d probably get much more bang for the buck creating a weekly podcast? Of course, I already podcast my sermons (though I am woefully behind in getting them up). But I have such low traffic, it may not matter. What I really need to do is…? It is not really self-doubt that I struggle with. More like skepticism that putting one’s hope in creating an audience is any kind of real success. I have to ask the bigger question, what am I called to do? Maybe I should return to the mission statement I wrote for myself years ago (where the heck is it?) and reflect on it, or just write a new one? Without doing the hard work, what would be my first guess at my personal mission statement? To create an inner, family, and church environment in which people grow to maturity, find their callings, cultivate loving relationships, and enjoy living life with God at the center. I guess I can think on that. Funny what comes out when you don’t over work it, eh? Except I’ve probably been cogitating on that for decades, so it’s hardly like it hasn’t been worked on. I’m not at 400 words. Looks like 500 words is just beyond easy (but not much). It does provide enough space to say something substantive. I’ll keep that in mind for the upcoming days. Don’t you hate how the ‘get rich on the web’ or ‘boost your traffic’ web sites are all teaching people how to get traffic? I mean, what does it really take to monetize a blog that is not training people to monetize blogs or make money? Do you have to end up training people to do something (other than make money!) in order to get continued income from something other than readership? I mean, if it’s only through content, you need lots of traffic to get ad revenue. But if you have less traffic, you need to upsell – either training or special content or personal coaching or something else that should be helpful and worth the investment. People value things that they pay for and have to do some work for – is that the bottom line? To make a living at your passion, you either have to be the best and make money that way, or teach others? I would like to make a living reading, writing, and speaking. And pastoring churches that make disciples. That’s pretty much it. How can my blog platform be part of making that dream a reality? Do I need to build a successful church first, and then people will want to hear what I have to say? Or should I build an online community in which I provide some value? Argh.